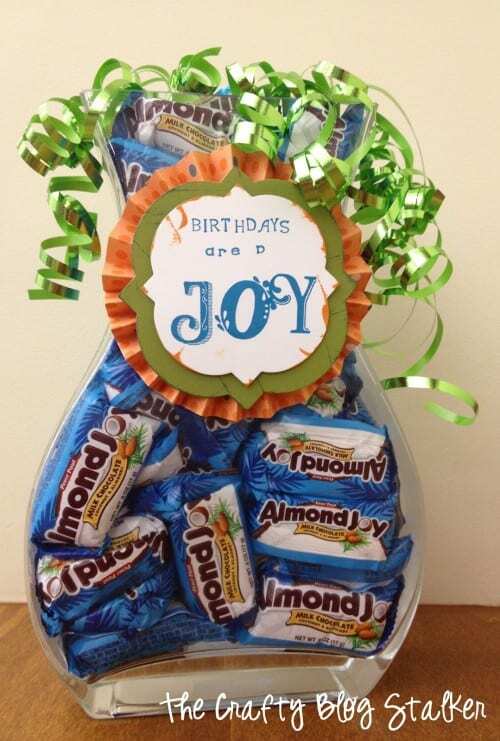 Surprise someone you love with a Birthday Candy Jar on their special day. An easy DIY craft tutorial idea for a handmade gift they will love! Several weeks ago was my hubby’s birthday and I wanted to do something special for him. We are lucky enough to work at the same place and I always leave about an hour later than him so I have the perfect opportunity to leave him a little something on his desk. For the medallion on the front, I made a Rosette. I have made these Rosettes in the past and you can go here to see how I make them. They are really quite easy! Using the Labels Framlit Die, I cut a larger size out of green cardstock and then the next smaller size into white cardstock. 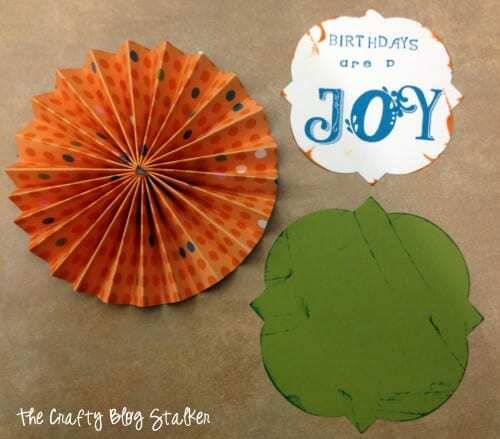 Stamp the greeting “Birthdays are a Joy” with alphabet stamps. 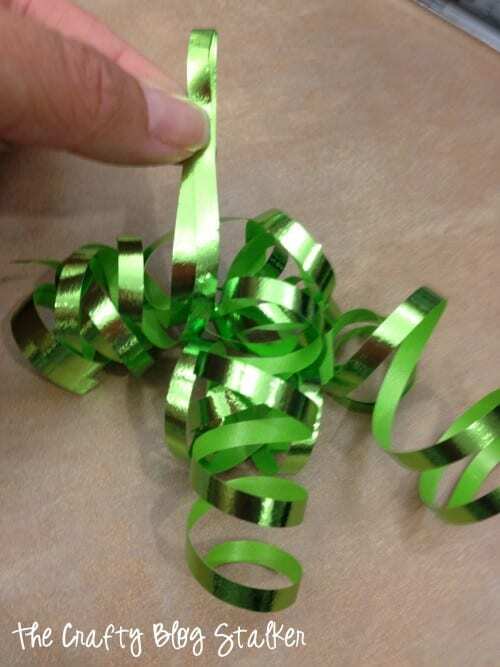 For the ribbon, I take a long strand of curling ribbon and curl it by pulling it across the edge of a pair of scissors. Layer a couple of strands together and fold them in the middle. 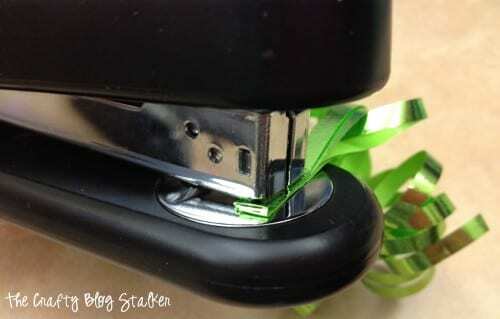 Staple the folded over end to secure them together. 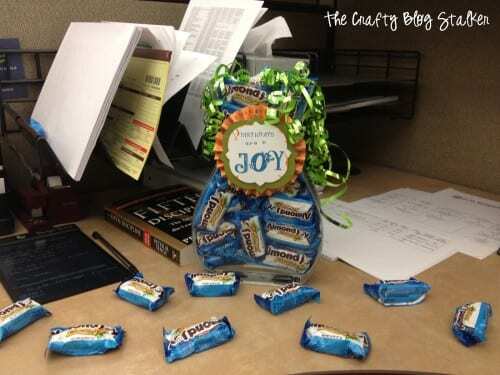 To assemble the jar, filled it with candy bars. Stick the medallion on the front with some glue dots and push the stapled ends of the curled ribbon in between the candy bars so they were coming out of the top. The night before his birthday, I snuck it down to his desk after he left work. I hope he had a fabulous Birthday!! What do you like to do for friends and family on their birthdays? Share and leave a comment below. 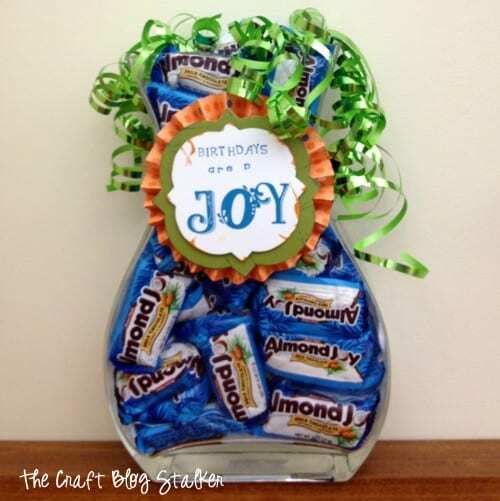 SAVE HOW TO MAKE A BIRTHDAY CANDY JAR TO YOUR FAVORITE PINTEREST BOARD! What a cute and yummy gift! Thanks for joining in with Tutorial Thursdays, I greatly appreciate it. Hi Katie: I’m Connie at http://hotflashncraftn.blogspot.com/, a new GFC friend. I would love if you stop by and be mine, too. Love the birthday candy jar, thanks for the idea. Saw this at One Creative Mommy. Thoughtful, creative and cute idea. I bet it was fun to put together and surprisw your hubby. How cute! 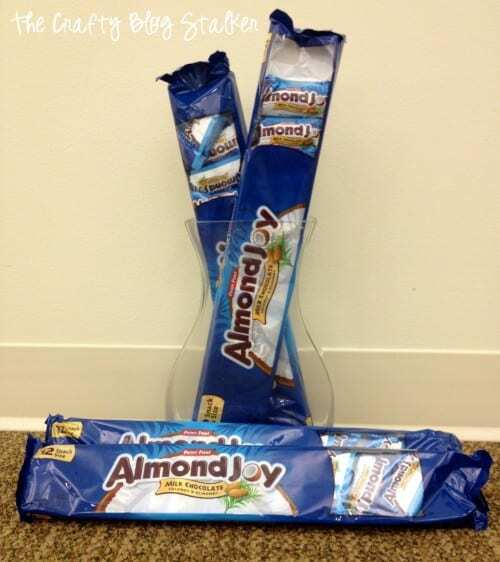 Almond Joys are my husband’s favorite! I should make something like this for him! Thanks for linking up with me for Friday Favorites! This is fabulous. Although I would use Snickers. Hehehehe. I love this.